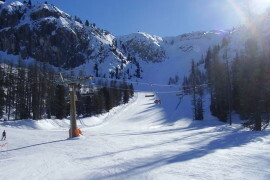 A High Energy Family Holiday in Selva Gardena. 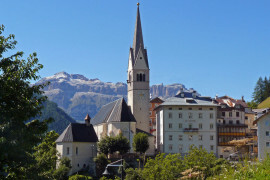 With such a spectacular location, in the embrace of the Italian Dolomites, the pocket-rocket village of Selva Gardena was never going to invite you over for a summer holiday and let you stay indoors all day! 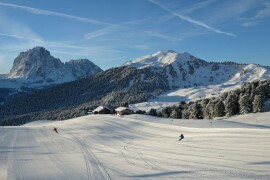 Within just minutes of the centre of the village is the vast natural playground of the Sella Ronda, and there are a million and one ways for an adventurous, energetic family with teenagers to make the most of a warm weather break. Forget the snow (until next winter at least): summer is the new black in Selva Gardena, having been voted one of the 10 most attractive destinations in Italy. Of course there’s the ubiquitous hiking and mountain biking trails of the Sella Ronda to explore, but why not up your cool quotient with the kids and suggest the following three slightly off-the-wall activities? Canyoning uses a combination of jumping, climbing, rappelling, scrambling and swimming techniques to navigate a route up, over and through the dramatic rocky landscape of the Dolomites. This thrilling adventure sport uses special equipment, which will be provided along with pre-excursion safety training. Step out of your comfort zone and get the adrenaline pumping as you navigate rushing waterfalls, leap crevasses in a single bound, and scramble up rocky peaks to conquer the Dolomites in an extremely satisfying way. Add a Go-Pro to your helmets and the kids will have an awesome video to post! Gardena Mountain Adventures ski school offers a range of group canyoning excursions with fully experienced guides starting from €70. How’s your balance? Why not put it to the test by learning the latest youth culture craze, ‘slacklining’? The dedicated Slackline Park in Selva offers lessons from experts, fun tournaments, and the opportunity for older children to push their limits in this challenging and exciting skill. Specialised slacklines are strung between timber posts and, by the power of tension and your own core strength and balance, the aim is (obviously) to walk the tightrope from one end to the other without falling off. The Selva Slackline Park is the only official space dedicated to the sport in the Dolomites. Check opening hours with the Tourist Office. A fabulous adventure for a family to sign up for, the ‘Move 24H – Summer’ is the ultimate 24-hour experience in Val Gardena, combining culture, cuisine, and incredible high altitude hiking – for 24 hours! You heard right, this unique guided tour takes you on a hike through the spectacular Dolomite landscape over a continuous 24-hour period, stopping at mountain huts to savour traditional dishes along the way, and bonding with your group on a deeper level via the shared physical experience. Taking in 54kms and altitudes of 2,850m, the Move 24H – Summer is invigorating, challenging and totally memorable. The cost of the tour is €195, which includes professional guides, all meals, a DVD of the hike, and hiking stick rental. Bookings and information from the Val Gardena Tourist Offices. If you plan on packing a lot into your summer break and want to access the entire Val Gardena region, invest in a Val Gardena card for everyone in the family. You can choose from a three or six-day pass, which gives you access to the network of public buses and ski lifts (which are adapted to carry mountain bikes in summer). A 3-day pass costs €60 for adults while a 6-day pass is €79. Under-8s cost €5, and for 8-16 year olds the prices are €43 and €57. Go on, do it all… if you still have the energy! You have the choice of several airports to access Selva Gardena, and it is within easy reach of Innsbruck, Munich, Bolzano, Verona and Venice. The latter is a popular choice, as numerous budget airlines service routes from the UK. From Marco Polo Airport, if you’re looking for the most convenient and hassle free way to get direct to your accommodation in Selva Gardena, you can pre-book a Shuttle Direct Venice airport transfer. The journey will take around three hours and, as your driver will meet you straight from your flight, there’ll be no waiting around for public transport with tired and hungry children. If you want to make the journey part of your holiday by driving from the UK to Selva Gardena, it’s around 12-15 hours driving time in total from Calais once you’re through the Eurotunnel. The most enjoyable and budget friendly route is through Germany (with an overnight stay somewhere) so you’ll avoid the high French road tolls, then up through Innsbruck, crossing from Austria into Italy via the Brenner Pass, which is an experience in itself. Once in Italy you’ll pass through Fortezza, Bolzano then on to the Dolomites. Garni Ortles – The whole family will feel at home in a spacious apartment at the Garni Ortles. The décor follows an Alpine theme with huge photographic murals, exposed timber beams, and charming traditional kitchenettes. You can relax on the balcony overlooking stunning views of the Dolomites, while the children can enjoy exploring the gorgeous garden setting. There’s also use of a nearby pool and fitness centre. Residence Isabell – You’ll love the fabulous central location of the Residence Isabell, and the children will make a beeline for the huge indoor pool, sauna, hot tubs and Turkish bath. After a day of energetic activities, the whole family will appreciate coming home to the stylish, spacious Alpine style apartments, dedicated relaxation room, sun terrace, and lovely garden. Hotel Sporting – The Hotel Sporting offers laidback luxury accommodation in the heart of Selva Gardena. With a warm timber décor throughout and stunning views over the mountains, the hotel is both sophisticated and welcoming of families. Extra touches like free bikes and a CD player in rooms will keep the children happy, while parents can enjoy the outdoor hot tub or Turkish bath in the wellness centre. Header image: “Groomed skirun from Seceda Val Gardena” by Wolfgang Moroder.- Own work. Licensed under CC BY-SA 3.0 via Wikimedia Commons.